This is a portrait of the John and Mary Ann Fry family of Wabaunsee County, Kansas. The family came to Newbury Township in Paxico in 1898. 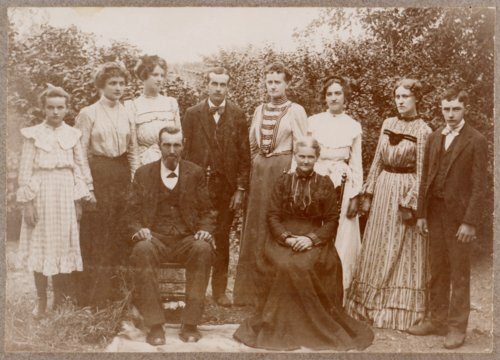 The other family members are identified as (left to right) Mary Ann Hund, Frances Fry, Lena Fry, Joseph Fry, Carrie Mueller, Elizabeth Rosenstengel, Julia Hesse, and Aloysius Fry.